United Campground has been a family owned and operated park for over 40 years. Located on the banks of the Animas River, Trolley Line and on the north edge of city limits, just 4 miles from Downtown Durango. Our campground offers over 100 level RV sites with water, electric and sewer, many shade trees and over 90 grassy and shaded tent sites. The Durango & Silverton Narrow Gauge Railroad runs right through the park. As your hosts, we want to help make your trip to Durango a memorable one. We are a family friendly park so bring your kids, grandkids and furry kids- we can't wait to see you! 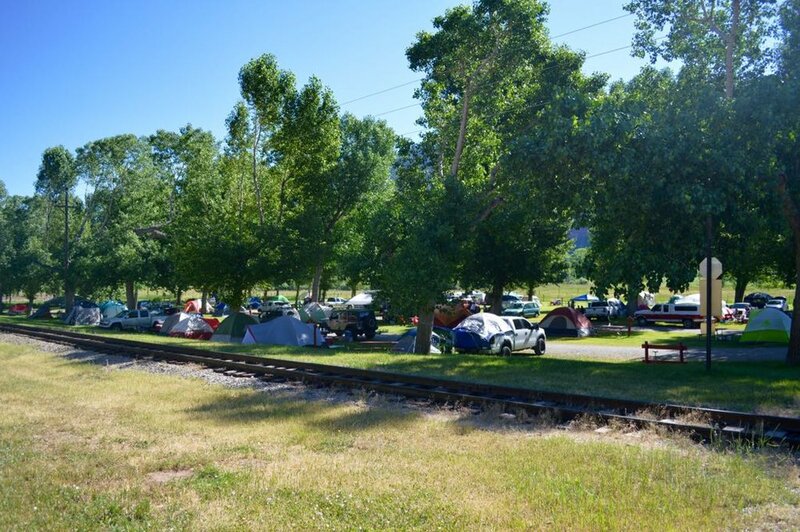 Whether you are in a basic water & electric site, or full hookups, our park offers level gravel sites with fabulous views of the Animas Valley and River. 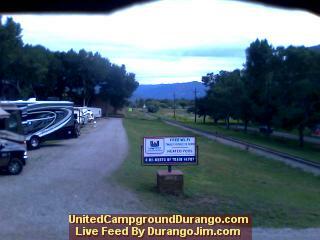 United Campground has the best view of the Durango & Silverton Narrow Gauge Railroad as it runs right through our park. Wave to the passengers while snapping some amazing pictures. While wood burning campfires are not permitted, your tent site does offer a lovely grassy area and picnic table, with bathrooms, showers and laundry nearby. Quiet time: 10pm-8am Mountain Time. No use of generators in the park at any time. When your neighbor gets grouchy from not enough sleep, there is no telling what may happen. So please remember that noise carries farther after it gets late. SORRY, NO CAMPFIRES ALLOWED! No wood burning of any kind. Propane and charcoal grills, and propane pits are accepted. VISITORS: All visitors of registered guests MUST STOP IN THE OFFICE to receive visitor's pass before going to any site. SWIMMING: CAUTION!! We do not have a lifeguard. Children under the age of 14 MUST HAVE ADULT SUPERVISION AT ALL TIMES in the pool area. SWIM AT YOUR OWN RISK! PETS are welcome ON LEASH (2 DOG LIMIT-No breed discrimination!). CLEANING UP AFTER YOUR PET IS MANDATORY! Absolutely no pets left unattended in campground, or tied to RV, or trees. Animal Control will remove any pet left unattended. Pets are not allowed in or around buildings, or pool area. We know your precious pooch is a good dog, but health code prohibits them from being in our store. PETS NOT ALLOWED TO BE WALKED IN TENT AREA OR MEADOW AREA. Absolutely no excessive barking or aggressive dogs tolerated. TRASH & GARBAGE: At several locations around the campground, you will find large containers in which all trash is to be deposited. To keep animals at bay, we ask that you keep our bear proof trash lids down. WASTE WATER: If sink waste water does not enter a connected sewer line or a holding tank, it must be caught in a container. Dumping of ANY KIND OF WASTE on the ground is PROHIBITED by public health law. MOTOR BIKES, ATVs, UTVs: Ride into or out of the campground only. MUST NOT CRUISE THE CAMPGROUND AREA. TREES: Please DO NOT hang anything or climb on the trees! IRRIGATION DITCH & TRAIN TRACKS ARE NOT TO BE PLAYED UPON OR AROUND! Please keep your kids and pets safe by not playing in these areas. We do charge an entertainment fee for sliding, rolling, and tumbling down the hillsides, so please use the designated stairs and roadways. SITE ACCOMMODATES RV AND ONE VEHICLE. If towing a cargo trailer you may be asked to disconnect and park it in the overflow parking area by the office. Due to the limited space, overflow parking is first come first serve, and cannot be guaranteed. Extra charges may apply. Your consideration in helping us maintain a safe, quiet, and attractive campground is sincerely appreciated!